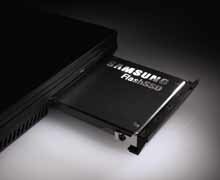 Samsung Electronics Co. announced today it is shipping its first self-encrypting solid-state disk (SSD) drives. The drives will come in 1.8-in. and 2.5-in. sizes for handheld devices and laptops, respectively. In tandem with Samsung’s announcement, Dell Inc. promptly introduced a suite of mobile data security technologies for its Latitude line of laptops, with native drive encryption expected to be available in the next few months. “The drive, which is designed to deliver some of the fastest encrypted storage available, offers customers eight and a half times the shock tolerance versus standard notebook hard drives,” Dell said in a statement. Full disk encryption (FDE) is already a standard feature on some desktop and laptop hard disk drives, including Seagate’s Momentus 5400 FDE.2 laptop drive. Samsung claims its SSD is the first to come with FDE.